A hairstylist said a client with the same last name as the Las Vegas shooter spoke in the months before the deadliest mass shooting in modern U.S. history about a concert venue being susceptible to attack, according to documents released by police Wednesday. Las Vegas police released about 2,100 pages of police reports, witness statements and dispatch records after losing court battles to keep them secret. Witness names were blacked out, so their accounts could not be verified, and police and FBI officials said they would not comment on the newly released information. The documents did not immediately yield answers to the key unanswered question more than seven months after the Oct. 1 attack that is still under investigation: a motive. They recount tales of horror and heroism, chaos and confusion. They detail how officers responded to the massacre, initially believing the Las Vegas Strip faced large-scale attack by multiple shooters and struggling to direct panicked people to safety and help save victims who were bleeding, begging for help and getting trampled. Authorities have not determined what led Stephen Paddock to open fire from his high-rise hotel room onto an outdoor concert below, killing 58 people and injuring hundreds more. Police and the FBI said they believe he acted alone and the attack had no link to international terrorism. 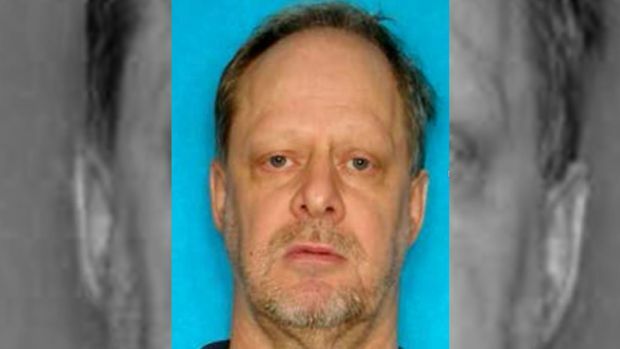 The hairstylist told investigators on Oct. 10 that a client named Paddock mentioned during a haircut in June or July that someone could shoot into a crowd at the outdoor concert venue from the casino across the way. A woman later arrived, and the stylist believed it was Paddock's girlfriend, Marilou Danley. "I asked her, 'Do you know what he's been saying to me?'" the stylist told police. "She's like, 'Oh, what, about somebody shooting into a crowd and, you know, wanting to hurt a lot of people?'" The stylist told police that the client said, "I wonder what she's worried about? She'll be out of the country." Danley was in the Philippines during the shooting. Clark County Sheriff Joe Lombardo, elected head of the Las Vegas Metropolitan Police Department, said earlier this year that he did not expect criminal charges against Danley. She had been called the only person of interest in the case. Audio released by MGM Resorts shows the moment a Mandalay Bay Hotel engineer was shot at by Stephen Paddock, just minutes before Paddock gunned down 58 people and wounded hundreds of other people during the 91 Route Harvest music festival in Las Vegas, Nevada. The stylist reported feeling uneasy and calling police about the comments but couldn't say when and wasn't positive of doing so. Police say in the interview that there's no record of a call. The documents also detailed gripping tales, including one from an officer who heard rapid gunfire on his radio and arrived to find hundreds of people running at him, many of them wounded and screaming. Other officers said they crouched behind patrol vehicles, unable to determine where gunfire was coming from while a rear window shattered and bullets hit the ground around them. A rookie officer, Brady Cook, was wounded in the arm. Detective Casey Clarkson was struck in the neck. Other officers, shielded by a block wall, reached concertgoers. An officer described trying to help a woman with blood gushing from a gunshot to her eye while a man held her head, asking for help. Gunfire began again, the officer said, "and I heard impacts hitting in front of me. At this point, everyone started screaming and I told everyone to move." Police tried to help people despite being unclear where the gunfire was coming from and facing reports of multiple shooters. The officer met with a rushing crowd said he responded to calls about active shooters at the New York-New York casino-hotel, the Tropicana across from the concert venue, and the Paris Las Vegas. No shooters were found. Vehicles carrying bleeding and injured people sped away from the shooting scene, flashing lights and honking horns. 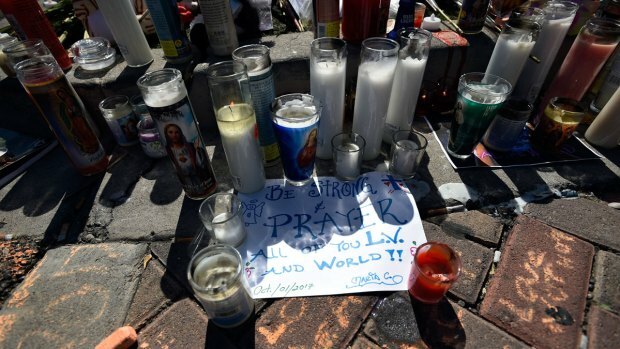 Authorities set up makeshift triage areas, where one officer "tried to keep the victims focused on staying alive" while figuring out some kind of evacuation plan. Another officer told a group of between 100 and 150 bystanders to take off any belts and T-shirts that could be used as tourniquets. An off-duty officer attending the country music festival said he tried to get his fiancee and a friend to safety, lying over them multiple times as panicked people rushed to escape. "As I was lying on top of them people were trampling over top of us trying to escape the area," wrote the officer, identified only as M. Amburgey. Authorities say Paddock, 64, a real estate investor and high-stakes gambler, had amassed an arsenal of nearly two dozen assault-style rifles and numerous high-capacity ammunition magazines. The documents also raised more questions about when police reached the shooter's room and why they waited more than an hour to enter it. "When we got off on the 32nd floor, we heard active shooting still going on," a Mandalay Bay hotel employee who said he accompanied a Las Vegas police officer. Authorities have said that gunfire stopped before police reached the 32nd floor, and that Paddock killed before officers reached his door. 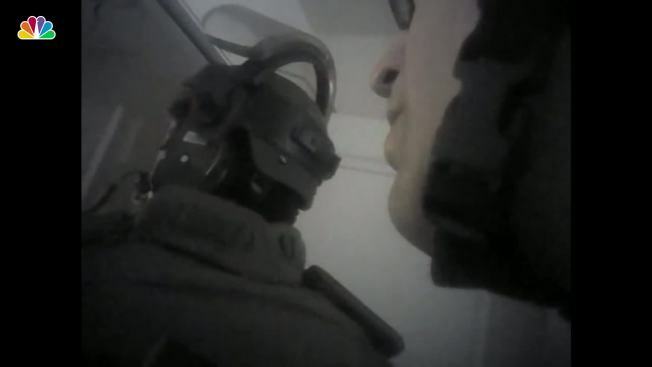 Police said they have compiled thousands of documents and amassed hundreds of hours of video, including witness cellphone recordings and footage from officers' body-worn cameras. The department has been releasing the information in waves after a court order in a lawsuit by The Associated Press and other media organizations. Contributing to this report were Associated Press journalists Michelle L. Price in Las Vegas; Scott Sonner in Reno, Nevada; Courtney Bonnell in Phoenix; Brian Eason in Denver; Amanda Lee Myers in Los Angeles; Martha Bellisle in Seattle; Lindsay Whitehurst in Salt Lake City; Terry Tang, Jacques Billeaud and Anita Snow in Phoenix; Mary Hudetz in Albuquerque, New Mexico; Becky Bohrer in Juneau, Alaska; Felicia Fonseca in Flagstaff, Arizona.